G1 Reissue Soundwave & Condor Cassette Buzzsaw Revealed! Soundwave and Buzzsaw get the G1 Reissue Touch. Our friends over at In Demand Toys has posted the first image of Reissue Soundwave with "Condor Cassette: Buzzsaw," on their Facebook Page. Soundwave is technically recreated from the original tooling, if previous reissues are any indicator... but you'll still notice a minor difference from your G1 Soundwave. When the character was recreated as New Soundwave Soundblaster during the 1987 Japan-exclusive Transformers: The Headmasters, the mold was modified to incorporate a slightly different door mechanism that could accommodate Soundblaster's 2-tape capacity. And thus has it been ever since. So it's a modification, but a vintage one, if that makes you feel any better! Thanks to Tformers.com for the information. In Demand Toys mentions that preorders will begin "soon." 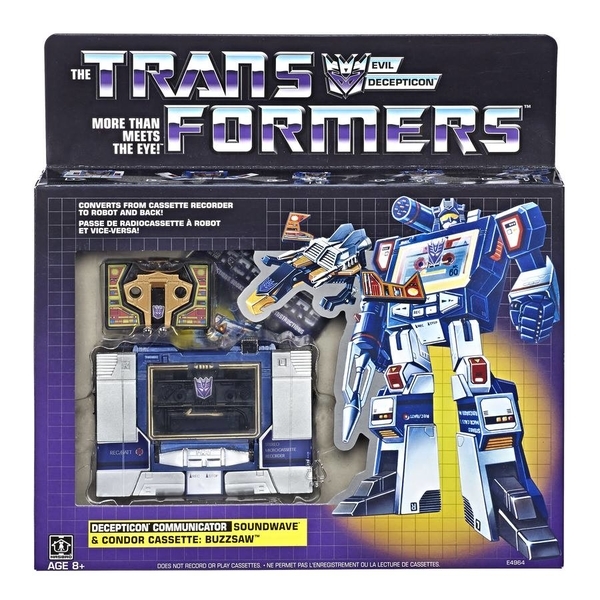 I hope we see Soundwave hit Walmart shelves like his other G1 reissue counterparts. Check back here later for more details and till next time, keep up the good hunt and collect on Transformer fans! Transformers Bumblebee: Blitzwing Collectible Figure Pre-Order Information. Transformers Walmart Reissued G1 Minibots Warpath & Gears. Is this your chosen Prime or will you pass on this Walmart Exclusive? Red or Blue. Which do you prefer? Transformers Masterpiece MP-44 Updated Color Images. Surprise! We now have promo images with color. It’s Optimus Prime Masterpiece 3.0! Toy Review: Transformers Siege: War For Cybertron Sideswipe. Sideswipe is one good looking action figure but does he delivery to collectors? Find out here. Mezco One:12 Collective PX Exclusive Hal Jordan Green Lantern. Intergalactic guardian of Sector 2814 is getting the PX Exclusive treatment. It’s gonna be like The Hunger Games in these toy aisles. MEZCO TOYZ NYCC 2018 Exclusive Revealed. We have our first look at Captain Marvel. Fan Expo Canada: New Marvel Legends Revealed. Coming 2019: More Marvel Legends Revealed! Neca TMNT up for Pre-Order at Gamestop. MASTER OF THE UNIVERSE 3.75" Figure revealed. 3.75" ReAction Figure Exclusives From Super7. SH Figuarts Dragon Ball Z Mr. Satan Pre-Order. The upcoming S.H. Figuarts Dragon Ball Z Mr. Satan figure has been posted and is scheduled to go up for pre-order starting August 17th in Japan. Click here for more info and pics.